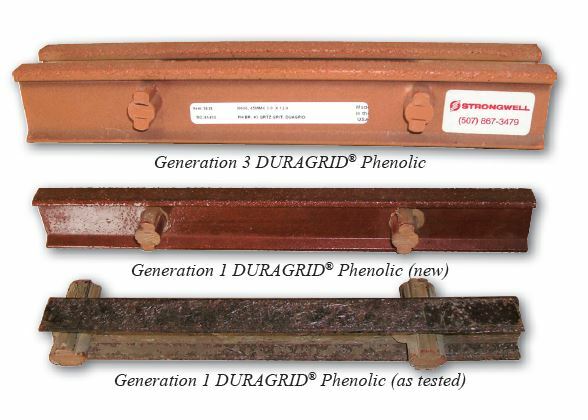 Strongwell was the first to introduce phenolic grating into the market when it released DURAGRID® Phenolic in 1994. To determine long-term viability of Strongwell’s phenolic grating, Strongwell tested a 36” (91mm) first generation I6000-38mm panel pulled from a 1996 installation on an offshore platform (TLP) in the Gulf of Mexico. The panel was subjected to a standard three point bending test on a 30” (76cm) span. Test results are summarized below. Note: Since this test panel was randomly selected from all installed panels and its exact properties upon installation are unknown, load table data was used for comparison. After the panel’s failure under peak load, the panel was re-loaded to 300 lb (136 kg) to measure deflection. Under this line load, deflection was 0.139” (3.5mm). To induce a deflection of 0.25” (6.35mm), the load was increased to 830 lb (376 kg). Thus, despite panel failure, DURAGRID Phenolic was still capable of supporting loads higher than typical design loads. Strongwell DURAGRID® Phenolic pultruded grating, since its inception, has been produced in conformance with quality standards ensuring the grating meets, or exceeds, published load table values at the time of production. With regard to long-term durability of pultruded grating, industry data is not available to accurately quantify strength and stiffness decreases in pultruded fiberglass grating over a typical service life. However, the included test results indicate strength will still exceed typical, in-service design loads, and any stiffness decrease is negligible (data shows a decrease less than 2% below typical stiffness values at the time of manufacture). Compared with alternative grating materials such as steel or aluminum, DURAGRID® Phenolic enjoys high strength, ease of fabrication and installation, light weight, high impact and fire resistance, low maintenance and unmatched long-term service durability. Strongwell has worked to continually improve our product strength, durability and impact resistance and feel that our current materials will perform even better than our first generation material in all aspects including durability and life expectancy. * Load table typical values generated from test data of first generation product manufactured in 1994. To view the complete technical review, click here.